As a one of Free State's bookend cornerbacks last season McFarland earned First Team All-Sunflower League honors as a defensive back intercepting 3 passes and making 20 tackles. McFarland is a long and rangy kid, and that, combined with his outstanding athleticism, makes him the perfect fit to run Free State's vaunted zone-read option attack. At the beginning of last season it was unclear as to who would be Free State's starting quarterback, and so McFarland and Joe Dineen split signal caller duties for the first several weeks. Head coach Bob Lisher eventually settled on McFarland and it worked out pretty well. McFarland completed 88 of 162 passes for 1,265 yards and 12 touchdowns and ran the ball 135 times for 783 yards and seven touchdowns. Mind you, he put those numbers up in a nine-game season, splitting duties early on. If the past is any indication, McFarland is in for a huge season if he can stay healthy. 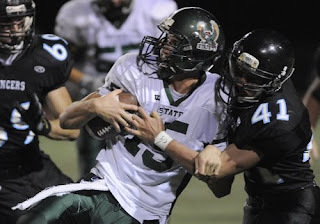 Predecessors in Free State's quarterback slot, including Camren Torneden and Ryan Murphy, all matured heavily in the team's offense as seniors after learning the ropes as juniors. Are the schedules for 2012 out yet? Do you have a link?